With a relationship that dates back to 1936, Delaware North and the Cincinnati Reds have a long history of providing memorable experiences at the ballpark. 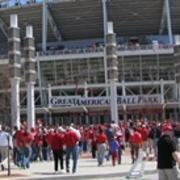 Delaware North Sportservice takes pride in serving as the food, beverage and retail provider at Great American Ball Park. Sportservice and the Reds made a noticeable addition to the ballpark for the 2014 season: The Reds Brewery District, an 85-foot-long bar between sections 117 and 118 on the third base concourse. It is home to 60 taps featuring 23 different craft beers, including 12 from the region. An Internship in Culinary at Great American Ball Park is focused on developing a strong operational capability in the student. Our students be coached by the Executive Chef and Sous Chefs and be challenged to execute at a professional production level. The Culinary Intern is expected to bring a passion and focus on learning, maintain a professional demeanor and be committed to the full term of the Intern/Externship. Maintain a clean and organized work area using ServSafe training.